A layer is linked to a directory, the location where all its drawings are saved. This directory has the same name as the layer. When a name is typed in a cell ,Harmony searches the layer's directory for the corresponding drawing to display. If there is no corresponding drawing, a new one is created. Drawings are exposed in cells and linked to the drawings saved in the layer's directory. When you remove a drawing from a cell, it is not displayed and still exists in the directory. A drawing that is exposed multiple times (for example, in a walk-cycle) would be linked to the same original drawing in the layer's directory. If you modify, repaint, or correct the drawing, all exposed drawings with the same name are updated simultaneously. You must duplicate or create a new drawing to modify a single exposure and retain the others. 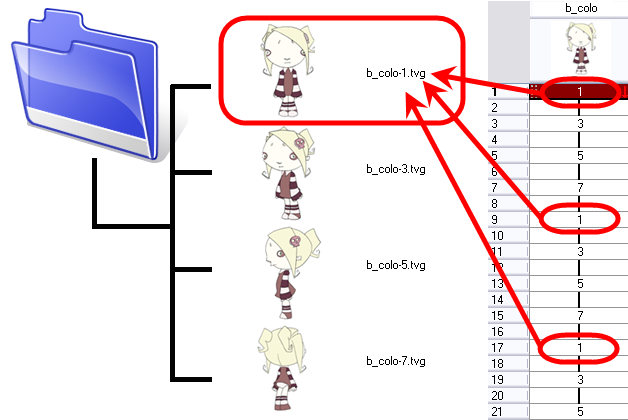 When you create a drawing cycle, all of the repeated drawings are linked to the original files. This means that when you modify, repaint, or correct a drawing named “1,” all drawings named “1” are updated simultaneously. In order to modify a drawing independently from its other exposures, you must duplicate the drawing.